This is the second in a series of Sunday posts about peaches. We like Calhoun County peaches from Illinois. The county is known for its peaches in the summer and apples in the fall. There are orchards all over the county, which makes it a destination place where you can bird watch, antique shop or visit historical places. We are all about the peaches right now! I made this flat bread for my neighbors at a block party we had in our alley. We are close in proximity and it is important for all of us to respect one another, which we do remarkably well! The neighbors loved the flatbread as I could tell from my empty pan! I had a lot of nice comments about it, too. The peach flat bread is super simple to make. I use some store ready ingredients which helps it be a quick dish to make. I love that I can whip it together in no time! 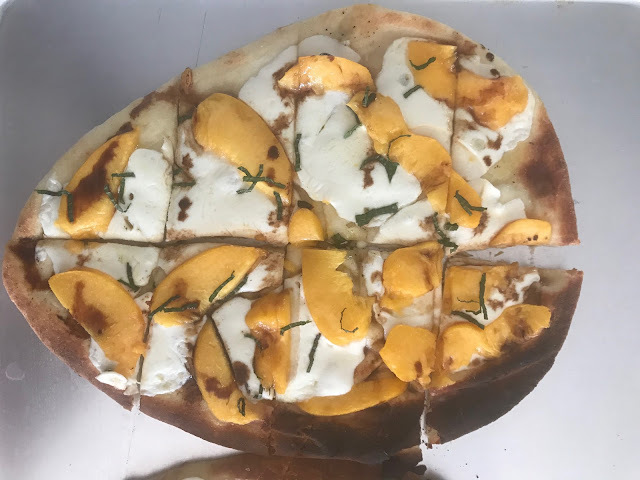 Made from store bought naan, fresh peaches and mint from your garden! Preheat the oven to 400. Remove the flat breads from the package. Cover a baking sheet with parchment. Place the flat breads on the parchment and brush olive oil onto each one. Slice the fresh mozzarella into thin pieces. Place on top of the flat breads. Spoon peeled and diced peaches on top of the cheese. Bake for approximate 10 minutes, or until cheese has melted. Remove from oven, sprinkled with chopped mint. Drizzle with balsamic, cut into pieces and serve warm. So what do you think? 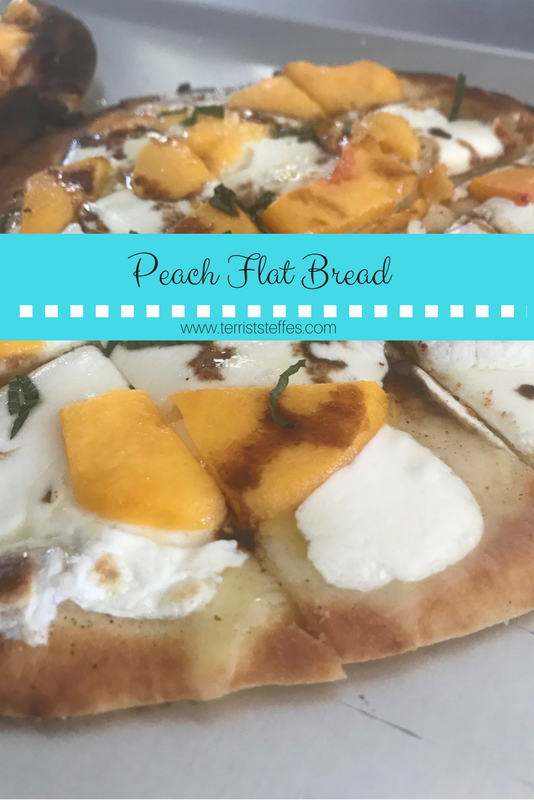 Could this peach flat bread find its way to your table?